Beverly Hills Diet has been revamped since the original was published in 1981 and is regarded by many as being the first fad diet. After losing 72 pounds on the original Beverly Hills Diet, the author Judy Mazel maintained her weight loss. Mazel died at the age of 63 from complications related to peripheral vascular disease. The original diet commenced with a 42-day initiation phase, which was based largely on fruit. The New Beverly Hills diet is less extreme and Mazel stated that it now meets the recommended standards for a nutritionally balanced diet. Dieters are told that they can expect a weight loss of 10-15 pounds in the initial 35 days of the program. As with the original diet, the New Beverly Hills Diet is based on the concept of ‘conscious food combining’ . Mazel states that it is not what or how much you eat that causes weight gain but rather when and in what combinations the food is eaten. She claims that poor combinations lead to inefficient digestion that triggers weight gain. Breakfast each day consists of fruit, which may be eaten, in unlimited amounts. However, only one fruit is to be eaten at a time. Dieters must wait one hour before switching from one fruit to another and two hours before eating any other types of foods. There are many days in the 35-day initiation plan where fruit is the only food consumed all day. Once a meal based on carbohydrates, fats or protein is consumed dieters are not permitted to eat fruit for the remainder of the day. If the next meal is based on carbohydrates dieters may continue to eat carbohydrates without restriction until protein is consumed. As soon as any protein is eaten all the remaining meals must consist of at least 80% protein. Dieters are permitted one free meal per day where they can combine carbs and protein however following this all meals eaten must follow the rule of containing at least 80% protein. Fruits form the basis of this plan. Papaya is said to soften fat in the body, pineapple burns off the fat and watermelon flushes it out of the body. Exercise is not a requirement however Mazel does acknowledge its importance for cardiovascular health and emotional balance. The New Beverly Hills Diet retails at $14.95. Good for people who like eating fruit. Includes a 35-day meal plan with recipes. No need for portion control or calorie counting. Author is very positive and motivational. The plan involves many days where dieters eat fruit only. Some of the suggested tropical fruits may be difficult to find in some areas. Initiation phase is very low in calories, deficient in many nutrients as well as being extremely deficient in protein, essential fats and minerals. Includes many rules, which require dieters to keep track of foods eaten and which may be confusing. Based on food combining which has not been proven to affect weight loss. Does not teach dieters how to eat balanced meals for long-term weight loss. Not based on established scientific principles. The reason people lose weight on this diet is probably due to restricting calories rather than the fat burning qualities that are attributed to specific fruits or the effects of food combining. The new diet is slightly more balanced than the original Beverly Hills diet as it includes animal protein whereas the original plan was based on fruit only for the first ten days. However, The Beverly Hills Diet is still is a low calorie diet that is also very low in protein, which will increase the risk of dieters losing muscle mass. The result of this will be a reduced metabolism that will make it highly likely that dieters will regain the weight when they resume normal eating. I have done this diet since the 90s and Yes it does work and yes it is extremely fast and yes if you go back to the eating habits that made you uncomfortable in your skin, you will gain it all back. I take exception that this diet is low in calories as 1 pineapple has 452 calories and one grape has 2 calories. On pineapple days I eat at least 2.5 pineapples just in the morning. That’s almost 1000 calories by 10 am. On grape day I try to eat 2 full bunches. I’m not going to do that math but it’s a lot of calories. Remember you can eat as much as you want and the more I ate the more I lost. If you do this diet, know the following: the first 3 days will make you feel like you’re dying. Your head will hurt likely due to withdrawals. Maybe due to caffeine, sugar or both. You WILL find any reason to cheat. Go ahead. I buy the little soda cans and keep them at work. If I get to the point where it affects my work I drink one. That goes away after about a week and the rest of the time is fine. If I’m hungry or just need something else, I wait 2 hours and pop popcorn on the stove at night and eat it with real butter. I still lose weight. I also do not give up coffee but I do restrict it to no more than 16 ounces. Yes I use half and half and sweetener which is strictly forbidden on this diet. I do this diet about once a year and it always works for me. This diet was also my ringer in a weight loss competition in which I went from 195 lbs to 162 lbs in 6 weeks. I also walked on a treadmill 2 hours a day the last 2 weeks of the competition. Once in the morning and once at night. When the competition ended I gained 8 lbs the next day, but maintained the difference for a couple of years. I was also $600 richer for winning. (: however, be very careful exercising on this diet. My trick to being able to stay on this diet is blending. Actually eating that much fruit hurts your mouth inside and out and if that happens you will have to stop until it heals. I blend all of the fruits. Even the prunes. Because prunes are gross. I do not necessarily believe the concepts taught in the books, but the diet does work if you follow it. The diet is only for initial weight loss, and anyone who needs to lose the weight will be fine for 3-5 weeks. The major good part is the maintenance diet part, the for life part. I have been on it for 26 years and, at 65, can keep up with those 20 and 30 years younger than me. Added bonuses are great finger nails and hair. Focusing on the initial diet only is silly. Hi, i had the new version of this diet, the new bh diet, but i want to do the original version, however, it hasnt been solf for months. i hopefully wish to receive from anyone the original version. thanks a lot. its a very effective diet i tryed it myself, i lost 20kg/ month with sport, most of them in beging but u will diffnetly reach ur goal at the end. the only thing that i didn’t like it or i found it diffecult for me, is that swiching from food to fruit, but the result alwayes gave me the curage to keep on. Excellent diet—only thing that works for me! I feel great. When I get away from it and have too much funn eating!!! I go back on it for a FEW DAYS. Usually I can lose about 10 lbs in a week. People who criticize this diet—do not know what they are talking about! Hmm eating fruit…yeah thats really badd for you! Give me a break! I’m on it right now—dropped about 3 lbs yesterday. oh.. and by the way, I didnt even follow the diet plan. I ate whichever fruit I craved everyday and when with what I had. After reading the book in full you should get it and once you understand it is really easy to make your own plan. If you are curious order the original book, read it and try the diet wholeheartedly. Remember, McDonalds is not closing down tomorrow!!! This diet is not a mythical thing. It is a methodically developed plan that will help you lose the weight! The best part, you can eat as much of the fruit as you want when no portion size is set. Unlimited strawberries truly means unlimited strawberries. When I was a senior in high school I started the diet and lost 40 pounds in 4 months. By graduation I was at 160 pounds and I felt great. I did the diet while doing normal high school activities including step team which included running 3-5 days a week. I had amzing amounts of energy, my skin was clear and even and if I needed to lose weight again I would definately do Ms. Mazels diet in a heartbeat. You really learn your body and that is a gift in itself. My mum is post menopausal and does the original diet each year right after christmas, as a detox and to get rid of any weight gained (she’ll vary the amount of weeks depending on the circumstances). She always loses the weight and feels great on it. I’m currently doing it and have never felt better. It’s amazing how full you feel and how much your confidence grows when you stick to it. It’s hard but totally worth it. It’s a great way to start you off for a life of healthy choices. I did this back in it’s hey day and had amazing results. I currently find myself trying to lose 8 pounds and it’s not coming off and I feel sluggish. I’m hoping to have the same success and would love to lose the weight. Hopefully at my age of 49 and being post menopausal it will still work. Has anyone had results who is postmenopausal? I would love the feedback. Thank you. I had great success with this diet. I lost 17 lbs 35 days. In addition, I have also been able to keep the weight off for 3 years. I really would like to know more about this diet. Do you have to have the book to do the diet? I too am hoping someone out there with a few minutes can PLEASE email me the diet. I cannot find the book. @ martha the book is available on amazon for 10 dollars. click on the links or picture above and buy it instead of asking people to break the law by copying copyrighted material. I went on the old beverly hills diet back in 2001 and lost like 50lbs.It does really work.I had so much energy.I was in my forties at the time.I gained all the weight back over the years due not taking care of myself.I am going on it again.I will do the old Beverly Hills diet.It really works.I have just turned 52 and need to take better care of myself.Good luck to anyone on this diet. I tried the old bhd in 05 and lost 14 pds in 2 weeks! Also felt great, lots of energy. I have gained the weight back because of poor eating habits, etc. It definitely takes lots of effort &willpower,especially if you have a family to cook for. I did the original diet 15 years ago and it really works. Lost the weight I wanted and was able to maintain. I now need to lose 10 pounds and am hop;ing to be very successful again. The fruit is amazing and this time of year it tastes wonderful. Wish me luck as I can’t wait to lose 10 pounds. I’m looking for info on the BHD, can anyone point my in the right direction to get info on the internet or forward my some info i.e. the day to day foods and weekly meal plans. really interestd in checking this diet out. oh, by the way – I used to have headaches and pimples. Headache’s gone, skin looks totally different already! Hi! Today it has been my 12th day of the diet. So far I’ve lost 13 pounds (I was roughly 181(81,600kg), now – 168(59,900kg))! It is a fantastic result! I do crave some protein (do not even dream of a fatty pork chop, just want some boiled chicken breast) and grilled veg. No carvings for sweets at all! I eat a lot of different fruit and berries, starting yesterday – added 1 portion of carbs a day (which is shredded wheat for breakfast). I do not do any other physical activity but at work (mind children + doing some tidying up) and the weight just flies away. It is not cheap to buy all different berries and fruit, but summer is just the right time to try it! Should you have questions, email me! I tried this diet, it works! I have lost 30 pounds and stick to this diet almost for one year. Some of my frieds tried it too. It is not an easy diet you have to stick to it in order for it to work. Good luck! Carnt wait to start this diet as soon as I do and start to lose the weight ill let u know.I carnt wait. I did this diet in 1985, lost almost 40 pounds, and want to do it again. I did love this diet as I was full of energy. Who can email me the diet at shnoodsle@hotmail.de please? 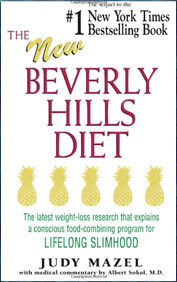 I would just love to find a group of people who regularly chat about this diet and their day-to-day experience with it – either one “The Beverly Hills Diet” or “The New Beverly Hills Diet” both diets are by Judy Mazel. I used to frequent her website “Cyberskinny.com” but as you likely know she has since dies and the site is no longer up and running. Is there anyone out there who knows of a forum I can join with people on this diet? Thanks for any help you can give me. By the way, I love this diet – it is healthy and it works. PS you have to stick to it ….. I tried the original Beverly Hills diet back in the 80’s and lost eleven pounds in ten days. I kept the weight off for 15 years and never budged more than a pound off that weight. Now in my 40’s I just went on it again…Wish me luck! Anyway, in my mind it is a book to retrain your digestive system and give it a brake from overload, kind of like when you were a baby an were introduced to foods incrementally. This is nutritionally balance just not all in one day or one meal. Good Luck! i really would like to go on the diet but does it work for all body types? I TRIED THE NEW BEVERLY HILLS DIET IN 98′ AFTER I HAD A BABY, AND NOT ONLY DID I LOOSE THE BABY WEIGHT OF 30# BUT AN ADTIONAL 20# MORE. THE DIET IS NOT JUST PRUNES, STRAWBERRIES AND BAKED POTATOES! I LOVE THIS DIET! would be so kind if someone could just take a few moments out of their time and email me the diet? i would love that since i cannot purchase the book online 🙁 i really need to get onto this.. I am an African American teenager from southern California and my mother was always a fan of the Beverly Hills Diet. I myself tried this diet several times starting at the age of about twelve. During my senior year of high school I buckled down for about three months and lost 40 pounds. Since then i have been able to maintain. The point of the diet is not to eat fruit only for the rest of you life but to live a balanced well rounded life and eat consciously. The Beverly Hills Diet DOES WORK. You just have to be strong enough to handle it! I dont like this diet.I used it for 2weeks and i gained 10 pounds back. I just eat healthy!). You do lose weight, and what I remember the most was my skin looked beautiful and my eyes got brighter. Seriously! The problem is that Americans tend to eat like there is no tomorrow…the gain up 400 lbs,and then suddenly they want to lose the weight over night, I really don’t know any other country with more serious weight problems than USA. American kids are obese, too. Sad. did this diet since 1986- it is great -lost lots of weight -over 40#, need to stick to maintaince guidlies it works well. Had lots of energy! Does the new beverly hills diet work as well as the old one??? this diet looks good but do u really hav to chge the fruits everyday or can u stick with that diet up there??? ?